Named By: Elmer S.‭ ‬Riggs‭ ‬-‭ ‬1903. Known locations: USA,‭ ‬Morrison formation. Fossil representation: Several specimens,‭ ‬the most complete of which is believed to have come from a sub adult. The sauropod dinosaur Brachiosaurus earned its name from the fact that the arms,‭ ‬or rather the fore legs as it was quadrupedal,‭ ‬are actually longer than the hind legs.‭ ‬The fact that these are longer offers Brachiosaurus a passive advantage in reaching up into the tree canopy to feed as the neck is always arched upwards as a result.‭ ‬Since the skeleton and vertebrae would be angled in such a way,‭ ‬Brachiosaurus would not need extra powerful muscles to lift the head and neck all the way up,‭ ‬reducing the effort to feed in such a specialised way. 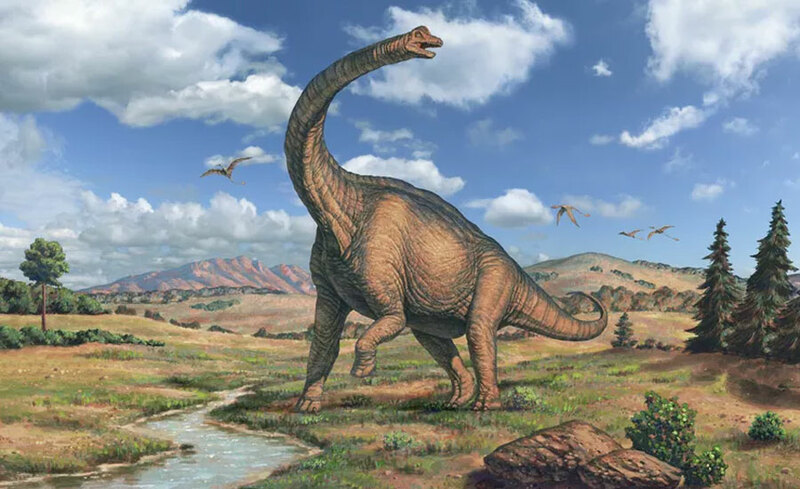 Its possible that Brachiosaurus was gigantothermic meaning its massive body would hold onto body heat for longer than a smaller animal.‭ ‬This would give Brachiosaurus a higher metabolism than a‭ ‘‬standard‭’ ‬cold blooded or‭ ‘‬ectothermic‭’ ‬animal.‭ ‬However,‭ ‬the air sacs that would have been present inside of the body may also have provided extra cooling allowing Brachiosaurus to lower its body temperature and metabolism.‭ ‬This would also reduce the required calorie intake to keep its body going,‭ ‬reducing the required amount of time for feeding. Fossils that were very similar to Brachiosaurus were recovered from the Tendaguru formation in Africa in‭ ‬1914.‭ ‬This new species was given the name Brachiosaurus branchai,‭ ‬but upon further study of the bones,‭ ‬several morphological differences were discovered,‭ ‬and while the new specimen was similar to B.‭ ‬altithorax,‭ ‬it was still different enough to be considered separate.‭ ‬B.‭ ‬brancai has since been renamed Giraffatitan,‭ ‬with the type species changed to G.‭ ‬brancai. It was once thought that Brachiosaurus had a skull like Giraffatitian,‭ ‬but when that was split off into its own group a possible key difference came to light.‭ ‬The crest forming bone that rises from the top of the skull of Giraffatitian,‭ ‬is much smaller in Brachiosaurus fossils.‭ ‬This crest was once thought to contain the nostrils but modern reconstruction places the nostrils further along the snout.‭ ‬This has led to speculation that this may have instead been a form of resonating chamber that could have been used to amplify the calls of Brachiosaurus. Previous articleBat-roost? To curb malaria!